Marina del Rey in Los Angeles is not far from LAX, but it is an area I have been frequenting more often, even from Malibu. 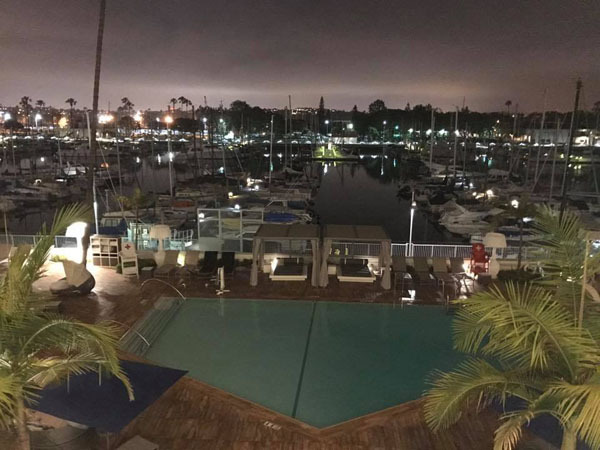 To change up your LA water views, a good place for a weekender is the Marina del Rey Hotel. The hotel’s 2014 renovation has brought a level of sophistication to the area. The true gem of the hotel is Salt, the waterfront restaurant and bar that offers outstanding cuisine with outdoor dining. Chef Mark Gold brings the best locally sourced California-seasonal dishes with ingredients from local farmer’s markets. We enjoyed dinner and cocktails with sweeping marina views. 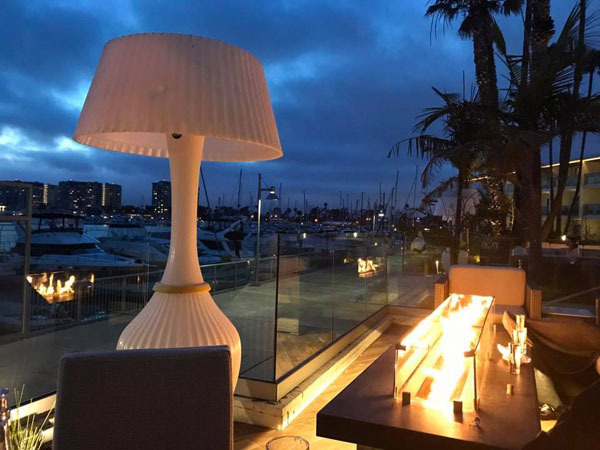 Heat lamps and fire pits keep customers happy dining outside when temperatures drop in SoCal. We devoured fresh hamachi and one of the best west coast creamy clam chowders we have ever tasted in LA full of large clams, potatoes, and carrots. 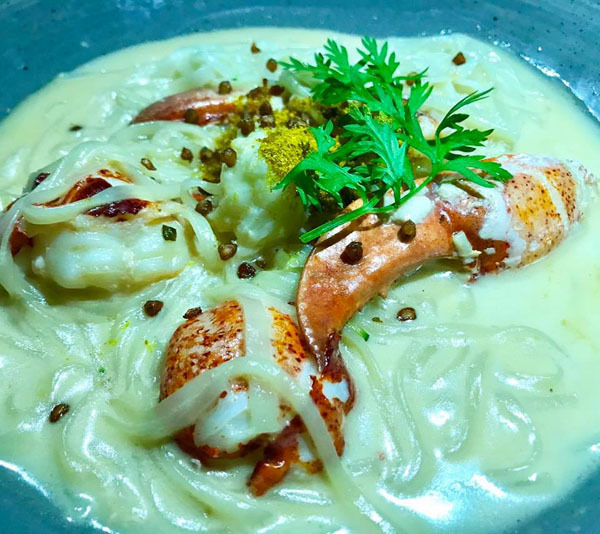 A whole succulent lobster (minus the shell) on a bed of Japanese udon noodles in a creamy brown butter sauce was a new flavor twist. This entree should be high on your ordering list. Other notable dinner items include Spanish seabass, handmade pork tortellini, line caught swordfish, and Mexican prawns in Bucatini pasta. The restaurant was packed all night, and everyone was fully enjoying themselves basking in the marina sailboat glow. Craft cocktails like the Bee’s Knees with botanist gin, honey, and lemon or Salt with house Serrano Infused 1800 Tequila, Grapefruit Liquor, Lime, Agave, and Orange Bitters will keep you warm. Salt’s alluring ambiance is perfect for a date, family gathering, or drinks. Looking to spend a less? The happy hour menu is from 4:00 to 6:30. Since I am very sensory oriented, I noticed during our entire stay how delicious the hotel smelled. Perhaps, they pump out a scent because I saw no candles in sight. Our room was clean and modern with a small balcony where we could view the sailboats parked in the marina, as well as watch the early morning crew and longboat regattas. 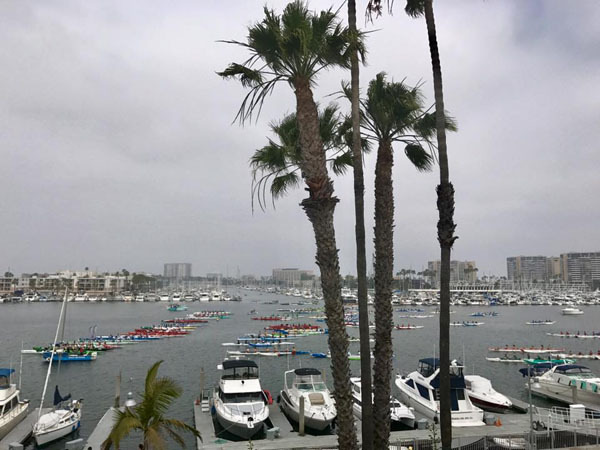 Did you know that Marina del Rey is the world’s largest man-made small-craft harbor? What stuck out most about the room was how extremely comfortable the bed felt, that perfect blend of not too soft and not too hard. I did not want to get out of the bed in the morning. Every guest room or suite features a balcony or patio, as well as a host of in-room amenities – like complimentary Wi-Fi, a 55″ HD LCD TV with cable and pay-per-view movies, a Keurig coffee maker, plush bathrobes, and 24-hour room service. If it was warmer and the marine layer burned off, we would have spent Saturday at the new hip heated infinity pool. Instead, we opted for a lazy long brunch, which was as equally impressive as dinner with a myriad of options. Salt’s exciting brunch menu offers burgers, French toast, steel-cut oatmeal brûlée with toasted pumpkin seeds, and fresh berries, and various egg dishes like a French style omelet and Buenos Dias Chilaquiles with fresh tortilla chips, poached egg, chorizo, avocado, black beans, Hook’s cheddar, radish, red onion, and roasted tomatillo sauce. Also, beginning Sunday, May 28 from noon to 6 PM, guests and the public can drink, dance, and lounge poolside at the hotel’s Sunday Boat House featuring the hottest DJs, weekly themed events, and luxury cabana rentals.